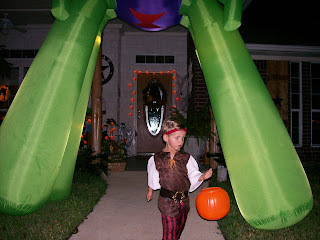 This was our first year to take Dawson trick-or-treating. He was very excited about trick-or-treating - he had seen an episode of the Little Einstein's trick-or-treating and wanted to reenact it himself. 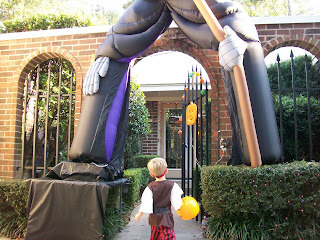 He likes knocking on the door or ringing the door bell, was happy to say trick-or-treat each time, but seemed to think that part of trick-or-treating was exploring the inside of people's houses, as he walked right past the people and into their living rooms several times. He didn't care at all about the candy unless it was a sucker, the one and only candy he'll eat. He most enjoyed the up-close view of all the Halloween decorations. 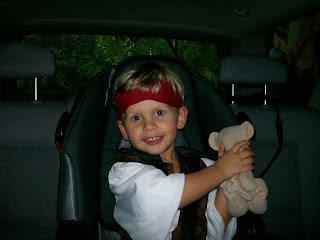 In the car on our way to trick-or-treat - he's so excited! Approaching the first house on our trick-or-treating journey. Dawson especially liked trick-or-treating when it was dark and he could really see and appreciate all the lights and decorations.